The 2019 Ramsey County Public Health Awards were presented at the April 2 board of commissioners meeting in celebration of National Public Health Week, which is April 1-7. Two organizations and two individuals were honored for their exceptional contributions to improving health by advancing racial and health equity in the community. East Side Neighborhood Development Company - for the nonprofit’s work to reduce child lead poisoning in low-income, inner-city neighborhoods. The Hmong TB Advisory Council - for its work to increase awareness of multi-drug resistant tuberculosis and to stop its transmission in the community. Como High School student Dissel Moo - for mentoring youth at Sejong Academy about healthy choices and active living. Tamara Stark - for her work to prevent violence and create safe spaces for youth and adults. Nominations for the awards were submitted by the public earlier this year. This is the fifth year Saint Paul-Ramsey County Public Health has recognized individuals and groups for their work. Nominations for the 2020 Ramsey County Public Health Awards will be accepted starting in January of next year. Public Health Awards information and list of previous winners. In 2017, after 10 years of partnering with Saint Paul – Ramsey County Public Health on lead window replacement, the East Side Neighborhood Development Company launched the LeadSafeMN initiative. The three-year project has the goal of reducing the rate of child lead poisoning to as close to zero as possible in three East Side census tracts that are “hotspots” for lead exposure. Additionally, the initiative is working to form a statewide coalition to get resources to similarly reduce child lead poisoning in approximately 35 other census tract hotspots in low-income, diverse, urban and rural communities throughout the state. The TB council began work in the spring of 2018 in response to an ongoing outbreak of multi-drug-resistant tuberculosis (MDR-TB) among Hmong Americans in Ramsey County. The council, formed by Saint Paul – Ramsey County Public Health and the Minnesota Department of Health, includes Hmong American leaders in clinic systems, hospitals, and other community based organizations - all of whom have a strong interest in improving awareness of TB and stopping its transmission. At monthly meetings the council identified crucial audiences to target for outreach, helped to develop a better understanding of why Hmong elders may be reluctant to seek care, and crafted new messaging that better resonates with the community. The council has also been an advocate for legislation to better protect seniors in the future from exposure to TB. Dissel Moo is a Como High School sophomore who spends his free time as a volunteer, mentor and advocate for healthy choices and active living. Moo plays on the varsity soccer team at Como and has volunteered for the past two years as an assistant soccer coach at Sejong Academy, a charter middle school he attended. He not only helps coach and assists at Sejong Academy games, but also mentors younger students about healthy choices involving exercise, food and teen issues. The students Moo helps are English language learner refugees from Burma and Thailand, many of whom cannot afford the fees or manage transportation to play in club sports. Through his volunteering at Sejong, Moo is helping youth who otherwise cannot afford it, get access to sports. 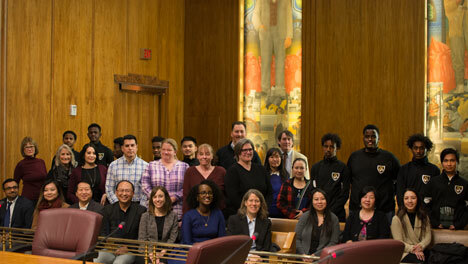 As the chair of the county’s Violence Prevention Action Team for the last three years, Tamara Stark has provided leadership on equity issue and empowered youth and adults affected by violence. Through her leadership, the action team has held numerous learning sessions to expand solutions to public health problems involving youth incarceration, historical trauma in the African American community, health disparities, healing from trauma and models for youth violence prevention. Stark’s contributions and guidance have helped to enhance Public Health’s Health Equity Data Analysis, the department’s Community Health Assessment and the action team’s “Safe Places for Braver Voices” report. Her collaborative approach has fostered multiple community partnerships to provide training and skill development for many individuals and organizations working to prevent violence. Posted on Tuesday, April 2, 2019 - 10:24 a.m.